04 March 2019 / Kiel, Panama City. How can a species split into several new species if they still live close to each other and are able to interbreed? Using a group of Caribbean reef fishes as a model system, a team of scientists from the GEOMAR Helmholtz Centre for Ocean Research Kiel in Germany and the Smithsonian Tropical Research Institute in Panama has found that natural selection can couple the evolution of genes for vision and colour pattern. The team has published its findings today in the international journal Nature Ecology and Evolution. or a new species to evolve, two things are essential: a characteristic—such as a colour—unique to one species and a mating preference for this characteristic. For example, individuals from a blue fish species prefer blue mates and individuals from a red fish species prefer red mates. If the two species interbreed, the process of sexual recombination is expected to destroy the coupling between colour and mate preferences and form red individuals with a preference for blue mates and vice versa. This will prevent the two species from diverging, and this is one of the reasons why it has been thought for a long time that new species can only evolve in absolute isolation, without interbreeding. “To address this question, the first challenge was to identify an animal group in which species are still young and interbreed, with clear species characteristics, and in which the bases of reproductive isolation are well understood”, Oscar Puebla explains. 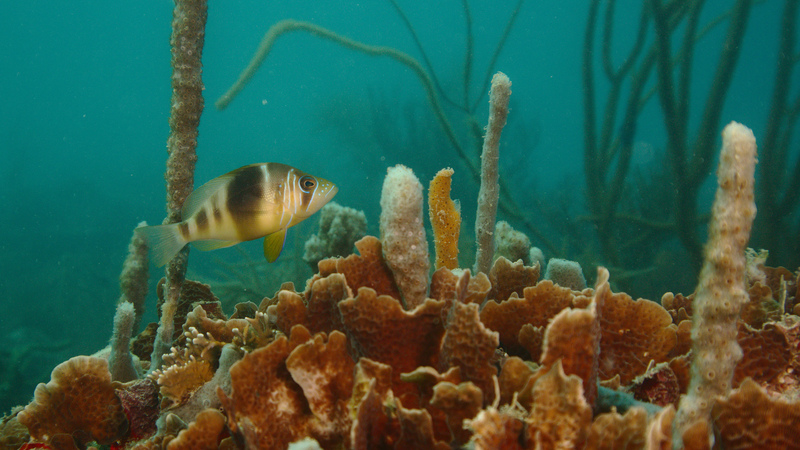 The hamlets, a group of closely related reef fishes from the wider Caribbean, constitute exactly such a group. The hamlets are extremely close genetically, differ essentially in terms of colour pattern, and are reproductively isolated through strong visually-based mate preferences. A second difficulty consists in identifying the genes that underlie species differences and mate preferences. The authors of the new study have assembled a reference genome for the hamlets and sequenced the whole genomes of 110 individuals from three species in Panama, Belize and Honduras. “This powerful dataset allowed us to identify four narrow regions of the genome that are highly and consistently differentiated among species in a backdrop of almost no genetic differentiation in the rest of the genome”, co-author Kosmas Hench from GEOMAR says. In line with the ecology and reproductive biology of the hamlets, these four intervals include genes involved in vision and colour pattern.